We're looking for a few more Chamber Ambassadors! 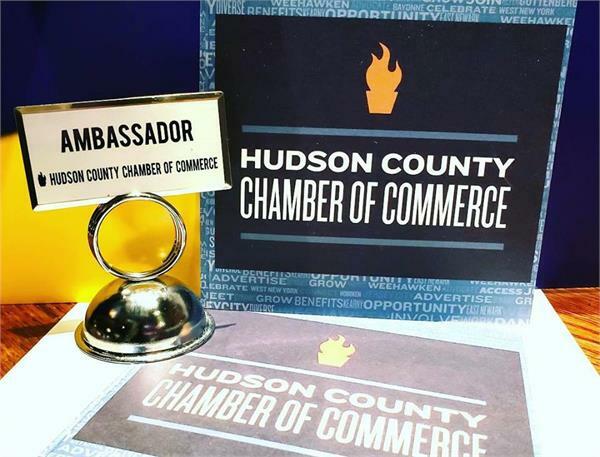 Ambassadors are visible faces of the Hudson County Chamber of Commerce. They are an influential group of volunteers from the membership who serve as champions and represent the Chamber at local community and Chamber-sponsored events. The program helps to build a strong Chamber community by bringing Seasoned and New Members together so that we can serve our mission to drive economic growth in the region. Ambassadors support the Chamber’s mission by raising awareness of the activities and assisting with Member retention, engagement, and recruitment. Ambassadors strengthen the overall relationships in the community. Must be a Hudson County Chamber Member or representative of a company in good standing. Must be a Member of the Chamber for at least 6-month before applying. Limit to two Ambassadors per Member business. Willing to serve as a volunteer in support of Chamber projects and functions. Wear his/her Ambassador nametag at all Chamber functions. Assist in welcoming guests at events. Serve as a mentor for New Members. Share Chamber events on their social media. The term of an Ambassador is 12 months upon review of the application.